The 1792 Half Disme (pronounced deem, which later evolved into the modern pronunciation of dime as we know it) has the honor of being the very first coin officially struck by the United States government. While coins had been struck on American soil since the mid 17th century, and continued to be struck after the British colonies declared independence in 1776, no coins had been officially been struck and released by the newly founded country. A small coinage of half dismes, along with various pattern denominations were struck in 1792, marked the beginning of coinage by the United States Mint. However, in 1792, there was no Mint, and in fact, no building had been designated as a Mint at the time. This, and the first coinage of the young country, would come after the coinage act of 1792 had been authorized. This coinage act, the first which still has its influence over two centuries later, not only authorized coins ranging in value from half a cent to ten dollars, it also authorized the Mint to construct its first building. The cornerstone was laid in Philadelphia on July 31 of the same year, little over two months after President George Washington signed the law into effect. The half disme denomination (being five cents) was the only denomination which would be struck in a reasonable number the year the Coinage act was signed into law. Other denominations, such as the disme (ten cents) were only produced in extremely limited numbers, and are considered to be patterns. Production of copper coinage, being half cents and cents, would not commence until the next year. The other silver denominations were not introduced until 1794 (including half dimes with a different design) while gold coins were first struck at the Philadelphia Mint in 1795. The design of the 1792 Half Disme is believed to have originated from the so-called Birch cent, one of the pattern issues of 1792. The name appears on a very limited of survivors of that issue, one of the very first patterns for a proposed coinage, although it is unknown who he was. According to the Judd reference on United States patterns, it could either be William Birch or Robert Birch, both citizens of Philadelphia at the time, although this is unconfirmed. The obverse featured a head of Liberty, as the Birch cents, while the reverse shows an eagle in flight (much different from later versions used on United States coinage). The most prominent lettering is on the obverse, being “LIB. PAR. OF SCIENCE & INDUSTRY” (Liberty Parent of Science and Industry), which appears to have originated from Benjamin Franklin. Despite the fact that it has been traditionally listed in pattern references, it is believed that the 1792 Half Disme is the first regular issue coin struck according to the Mint act of 1792. However, there is some dispute regarding this statement, and some numismatic researchers still consider the 1792 Half Dismes to have been patterns for a later coinage. There are some facts that do not appear to fit in this context and they were made by George Washington himself. There have also been stories, perhaps correctly classified as numismatic folklore, that go along with the 1792 Half Dismes. First of all, for a pattern issue there was a relatively high mintage, believed to have been around 1500 to 2000 pieces in total. While one of the most famous pattern issues (the 1856 Flying Eagle cent) is sometimes incorrectly classified as a regular issue due to its high mintage, the late 18th century was a different time, and interests were different as well. Many of the 1856 Flying Eagle cents that are known to exist are believed to have been restrikes while no restrikes are believed to have been made of the 1792 Half Dismes. There are also two stories that have commonly been linked to the 1792 Half Dismes, although neither of the two appears to be correct, as per modern research. First of all, it is said that the silver that was used to strike the 1792 Half Dismes was personally provided by George Washington, who, according to the story supplied part of his own tableware to have a supply of silver to start the coinage in the basement of a Philadelphia saw maker. Modern research has revealed that this story very likely is incorrect, and that the U.S. Government supplied the silver, in the form of bullion. Secondly, it is also said that the inspiration for Lady Liberty on the obverse of the coin came from Washington’s wife, Martha Washington. When comparing the few contemporary images that are known of her with the design of the 1792 Half Disme this also appears incorrect, as the images do not share any similarities. Despite the low mintage, primitive circumstances in which it was struck, and apparent circulation of this issue, a relatively high number of uncirculated specimens are known to exist. “High” is certainly relative in the case of the 1792 Half Disme, as high grade examples only compose the distinct minority of an already low number of survivors. A recent auction description for the finest known example estimated that between 250 and 400 of the original mintage are known to exist in all grades. Judging by the number of auction appearances of this historic issue, the latter seems a bit high, and the true number probably lies closer to 250 than to 400. The finest known 1792 Half Disme graded by PCGS is a Specimen strike graded SP-67. While PCGS classifies this issue as a regular issue meant for circulation, versus a pattern as some other specialists do, it is without doubt that the SP-67 coin is something special. Its status as a specimen striking is disputed, and it does not appear to be the first coin struck from the dies, as some sources claim. This is attested by the fact that some faint die cracks are visible on the reverse of this coin, which are not present on some other examples, preserved in lower grades. However, the coin is very special, with a needle-sharp strike and prooflike surfaces. The finest known graded by NGC is an MS-68, and the second finest known is a MS-66 specimen. This latter coin is interesting in the fact that during the last couple of decades it has been graded as Choice AU and MS-63 before being encapsulated in a NGC holder. It is believed that this coin is the 3rd or 4th finest known. Other high grade examples are not known to have been certified, although it is possible that they are included in either the PCGS or NGC population reports, or perhaps even in both. PCGS has also graded a coin as MS-67, which perhaps could be the same coin as the SP-67 specimen striking, or included in the lower grade populations. Two coins have been graded by PCGS as MS-66, and only a single gem (meaning MS-65). Six MS-64’s and three MS-63’s finish the roster of uncirculated examples graded by PCGS. It is believed that one of the MS-64’s is a duplicate of the MS-65 and that only a single PCGS MS-63 is known to exist, although this is unconfirmed. In addition to the two coins listed above NGC has graded five MS-64’s and two in MS-63. Without doubt these numbers include a relative high number of resubmissions. 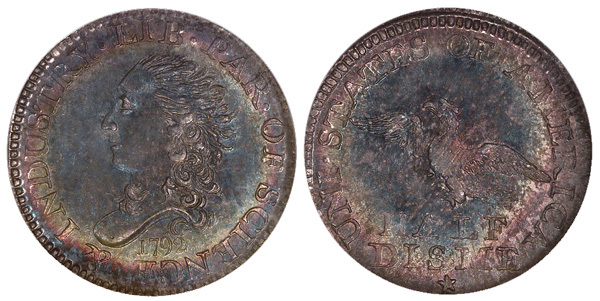 The NGC MS-68 coin listed above is known to have sold in a private transaction for $1,500,000, but the price record for any 1792 Half Disme at public auction was for the PCGS SP-67 specimen, which sold for $ 1,322,500 in April of 2006. Uncirculated and About Uncirculated 1792 Half Dismes easily sell for six figure sums, while circulated and damaged pieces often trade for sums near that level. Only barely recognizable and heavily impaired examples can be found for less than $ 10,000, but thanks to the historic status of this issue are even much in demand in those grades.